A groundbreaking love letter to 8 bits! 14,749 backers pledged $311,502 to help bring this project to life. Steam Time, Pulse Time, Box Time, Art Time... and Tinker Time! Get excited for our 24 hour Live Stream! We are going to be streaming LIVE for the last 24 hours of the campaign. We’re already brewing the coffee for our final hurrah! http://www.twitch.tv/yachtclubgames - Starting tomorrow, Friday at 8PM PST!! We are still formulating our schedule, so if you want to see us play something in particular, let’s hear it! We’ll detail the schedule in the next update. WHERE'S THE PIZZA!? We still need your help with Steam Greenlight! Art Contest is Over Today! We want this art contest to keep going forever, because we have been getting the best submissions in the universe. Alas, all good things must end. We are going to be compiling all the art starting at 5PM PST today!! That’s almost no time left, so hurry! We wanted to bring this Kickstarter to your attention. It’s such a cool concept (a game world that’s explored and revealed by sound - incredible!) , and even though we’re making a NES style game, we want to see totally unique, modern experiences too! We’re late to the party - they only have a few hours left!!! Go go back them right now! We did it! Now, all backers over the $50 tier can put this wonderful, NES-Style box on your shelf to show your friends that you are all about Shovel Justice. NOTE: There is not actually anything inside the box... except our hopes and dreams! You could put the instruction booklet in there! Some knights love rushing into the glory of battle, ready to crush the skulls of their enemies! Tinker Knight is not one of those knights. He does his fighting before the battle begins, laboring on diabolical devices that do his work for him. The wrench is the tool of his trade, doubling as an engineering device and a melee weapon. 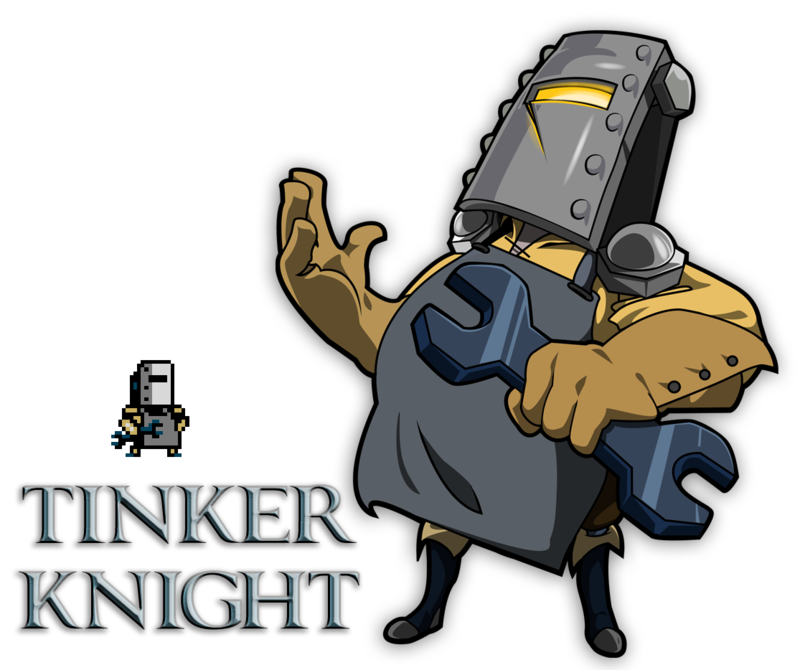 Some are quick to dismiss Tinker Knight’s lethality... usually just before falling victim to one of his mechanical monstrosities! Lastly, many people have asked for the trailer music in mp3 format, so here it is! 8bit music as it should be. Perfect. Um, sorry for the dumb question, but how can we download the theme? Or we are NOT supposed too download it? Will Tinker Knight be abnormally small compared to the other knights, as suggested by the Mega Man-esque picture showing all the members of The Order of No Quarter on your main page? I voted for the game on Steam Greenlight, this game should totally be on there, I mean have you seen some of the games that have managed to get on steam? Just the trailer to Shovel Knight blows them away. I know you showed a mockup last update and this update you confirmed it's happening, but was there an updated prototype somewhere I happened to miss? I'm dangerously excited to see it! Even though the 3ds version won't have wifi for multiplayer can you make it so you can play offline with CPUs? I'm a bit disappointed because on the main page you said that for 10$ we will get the game for PC and you mentioned Steam. But today, on the update 18, you said that getting Shovel Knight on Steam isn't 100% sure. Yeah I know, it's not the end of the world, I'm only wondering. Chalk me up for The Guardian Legend too and Blaster Master. No idea how extensive your library is but since someone mentioned Faxanadu, I'll mention something that'd be cool (though not sure if time would permit). Crystalis. You guys should have a contest to see who can correctly guess how many messages you'll get saying that you forgot to put the game in their box. So many GREAT news ! You know i am very glad that you promoted Pulse. I saw their kickstarter yesterday and I baked it, 'cause I thought the concept was interesting, I wanted to promote them here, but didn't dare to do it. You guys are just medium, you have super powers or something I just don't get it ! Tinker Knight ! I wonder if the other Knights mock his size or don't dare to do it ? I know it's a retro game, but that song made me think: What if you could unlock an orchestrated version of the soundtrack to play through the game with? Play the games that have inspired you to make this game! All the classic Mega Man games! @ThePukaki: There will be an album!!! @Jan Marcano: Battle mode is not going to be on the 3DS since wireless net-code is out of our scope for this project. The battle mode isn't fully designed but we'll let you know once it's designed! @Joseph La Dow: digital download for the CD will be available early to all backers as a pay-what-you-want format from Jake's bandcamp site. @Kathan McCallister: Jake Kaufman is the best! @Tom Katzman: Is he is own creation??? possibly....! How does Tinker Knight eyes glow like that? Did he tinker with his own body? Is he his own creation?! Play some Whomp Em on the NES! I'm surprised I haven't seen more references to this game here. Opps. I thought I read something about the soundtrack but was looking in the reward tiers. Good to know. BTW, Tinker Knight is awesome! Sounds like he might not be one of the playable knights given his skill set, but I wouldn't complain if you found a way! Thanks for the Trailer Theme! Jeff knocked it out of the park with the Shovel Knight theme! Of course, he does that an awful lot so I shouldn't be surprised at this point. I love how the theme goes from 'orchestral' to 8-bit tunes right around the 44 sec. mark! It was a combination on Mr. Kaufman's music, and Shovel Knight jumping triumphantly onto the screen that immediately sold me on the game, and looking back, I can't tell you how grateful I was to have stumbled on the trailer when I did. 230K+ later and look where the little guy has gone! Didn't doubt YCG and Shovel Knight could do it for a second! One of my favorite games from the NES era never gets any love; Conquest of the Crystal Palace pushed the NES to its limits and had a epic soundtrack to boot! For some retro multiplayer action, games like Twinbee, Snow Bros. or Bubble Bobble come to mind. When I saw it in Blaster Master Overdrive I was like: "No, not this guy again! I hate giant enemy crabs!" xD But luckily it was easier to defeat him this time around. joseph, yes - it'll be pay what you want. I've tried to draw something, but I'm just not good at it. Will there be a way to get a digital version of the soundtrack? I love the music so far but the CD is a little out of my budget right now. Tinker Knight? You could say that those who estimate him are tools. He'll tinker his reputation to do away with such foolishness someday. @Christopher Guest Oh man, The Guardian Legend! I've never met anybody else who knew about that game, but it was indeed awesome. So many good memories! Blaster Master is great too, but the bubble crab boss in level 5 is just evil incarnate. Some good suggestions there for you, YCG! Play SCP Containment Breach! Also I request Just Cause 2, just because it's sandbox madness. Perhaps try doing SSBB or Mario party? Or maybe if we wanna go retro: Jazz Jackrabbit 2 or Monster Party? :P You guys are amazing! Dark Souls Dark Souls DARK SOULS. What happened to the post explaining Battle Mode? Is it gonna be local multiplayer? How will it differ between platforms? I might consider getting PC version if it will support 4 player local multiplayer, since the 3DS would probably use local wireless, right? Hey YCG, I'd love to see you play Battletoads during the live stream. You don't have to do the whole game. Just play until you ragequit level 3 ;) For even more style points do coop mode . . . I will not wait! I must know now! Shut up and take my art! Thanks so much for the box guys. Really glad I upgraded to $50. You're welcome! The games looks and sounds awesome, and I'm a huge Mega Man fan - and the game play looks similar in a lot of ways, so I'm super excited about it! @Drew Newman: plans for the art contest are evolving as the amazing art is coming in and because we can't make up our minds lol. you'll just have to wait and find out! @Rolf W Jr: Congrats should be given to everyone here! It's because of our backers that we are getting anywhere! Aaaah the full trailer track. I just peed. How many winners for the art contest? Or just one? If you like a bunch, what are your plans? @Seth Adams: Thanks for your support! I'm really glad you are as excited about it as we are! Thanks for all the info. Congrats on a very well-run campaign. @Rolf W Jr: the album @ 60 is a physical CD! @paughthead: maybe not, but don't be surprised if you see those in an upcoming yachtclub storefront. I initially backed at the $15 tier for the game on Wii U. Then I upgraded to the $60 tier for the sound track because you have a composer from the Mega Man series on board, and I wanted the sound track. I also wanted the soundtrack and the paper manual because I wanted something physical to represent this game. I already have went as far as buying the button you guys gave out at Pax on eBay. I'm a game collector, and I can't tell you how excited I am to see this is going to have a physical box!!! I can't wait! Some suggestions for tomorrows game fest. @Rolf W Jr: Putting the funds towards the game rather than a physical copy is our priority. But at least the box will hold a great place on the shelf of everyone who is backing at the $50 tier and higher. Can you put in a couple of your awesome buttons in my game box?